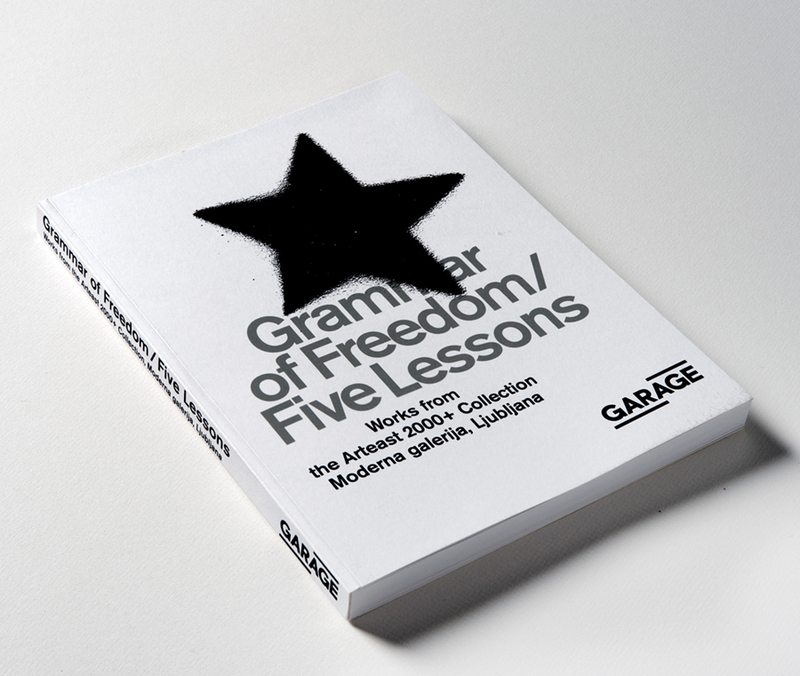 Garage Museum of Contemporary Art in Moscow, in collaboration with the Moderna galerija has just published the English version of the exhibition catalogueGrammar of Freedom / Five Lessons. Works from the Arteast 2000+ Collection. The exhibition, curated by Zdenka Badovinac, Snejana Krasteva, and Bojana Piškur was on view at the Garage Museum of Contemporary Art, Gorky Park, Moscow from 6 February until 19 April this year. The introductory texts consist of the preface by the founder of the Garage Museum of Contemporary Art, Dasha Zhukova and its Chief Curator Kate Fowle, the exhibition is presented by its curators Zdenka Badovinac and Snejana Krasteva, as well as the independent curator and chief editor of the Moscow Art Magazine Viktor Misiano. 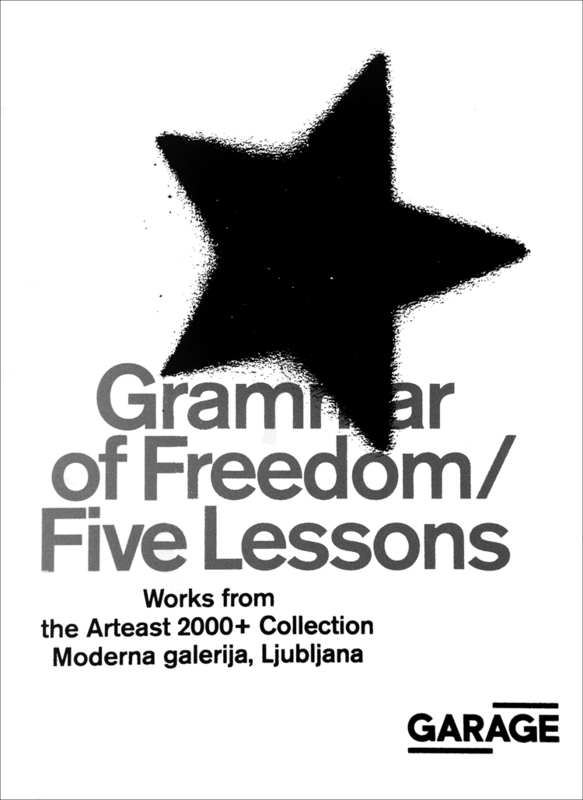 An important part of the catalogue are short presentations of the individual themes of the exhibition, organized around five open-ended "lessons," wherein a grammar for strategies used in search of freedom is developed. In the frame of the “lessons” we can read short presentations of more than 60 artists and art collectives, with works ranging from the 1960s to the present: Marina Abramović, Yury Albert, Nika Autor (in collaboration with Marko Bratina, Ciril Oberstar, and Jurij Meden (Obzorniška Fronta/Newsreel Front)), Yury Avvakumov, Jože Barši, Luchezar Boyadjiev, Geta Brătescu, Alexander Brener and Barbara Schurtz, Olga Chernysheva, Chto Delat, Lana Čmajčanin, Vuk Ćosić (in collaboration with Alexey Shulgin and Andreas Broeckmann), Goran Đorđević, Nuša and Srečo Dragan, Vadim Fishkin, György Galántai, Gorgona, Tomislav Gotovac, Ion Grigorescu, Marina Gržinić and Aina Šmid, Dmitry Gutov, Jusuf Hadžifejzović, Tibor Hajas, Ibro Hasanović, IRWIN, Sanja Iveković, Ilya and Emilia Kabakov, Vitaly Komar and Alexander Melamid, Alexander Kosolapov, Jarosław Kozłowski, Katarzyna Kozyra, Oleg Kulik, Zofia Kulik, Andreja Kulunčić (in collaboration with Ibrahim Ćurić, Said Mujić, and Osman Pezić), Vladimir Kupriyanov, KwieKulik, Laibach, Yury Leiderman, Kazimir Malevič, Yerbossyn Meldibekov, Jan Mlčoch, Andrey Monastyrsky, Ivan Moudov, Via Negativa, Neue Slowenische Kunst (NSK), Timur Novikov, OHO, Anatoly Osmolovsky, Marko Pejhan, Dan Perjovschi, Tadej Pogačar, Darinka Pop-Mitić, Zoran Popović, Dmitry Prigov, Franc Purg (in collaboration with Sara Heitlinger), Guia Rigvava, Józef Robakowski, Alexander Roitburd, Mykola Rydny, Arsen Savadov, Kalin Serapionov, Nebojša Šerić–Šoba, Nedko Solakov, SOSka, Ilija Šoškić, Petr Štembera, Mladen Stilinović, Krassimir Terziev, Raša Todosijević, Slaven Tolj, Milica Tomić, Goran Trbuljak, Josip Vaništa, Sašo Vrabič, Vadim Zakharov, Dragan Živadinov with Dunja Zupančič and Miha Turšič, and Konstantin Zvezdochetov. The publication is available at the Moderna galerija's bookstores MG+ Bookstore and DEPO Bookstore.